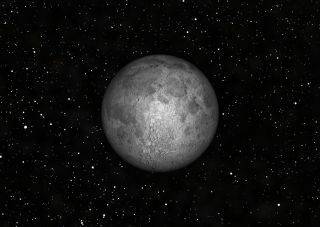 The Full Moon of July 2012 occurs on July 3. It is known as the Hay Moon. The July full moon will rise like a bright night sky beacon tonight (July 3) in a sort of celestial preview to the traditional Fourth of July fireworks that will light up U.S. skies on Wednesday. July's full moon has many names, but is often known as the Buck Moon because it occurs at a time of year when new antlers began to emerge from the foreheads of buck deer. Another common name is the Thunder Moon since thunderstorms can be common this time of year (just ask the thousands of East Coast residents still without power this week after recent storms). This month's full moon will actually reach its peak at 2:52 p.m. EDT (1852 GMT), but it will still appear full to the casual night sky observer tonight. It may also appear full to the unaided eye Wednesday (July 4) during traditional fireworks displays associated with Independence Day holiday celebrations across the United States. Full moons occur when the moon arrives at a point in its orbit that places it on the opposite side of Earth from the sun, allowing its entire disk to be illuminated by sunlight. Other names for the July full moon include the Hay Moon and Mead Moon. In Hindi, this month's big moon is known as Guru Purnima while to Buddhists it is called Esala. If you snap an amazing photo of the July full moon that you'd like to share for a possible story or image gallery, please send images and comments to managing editor Tariq Malik at tmalik@space.com.